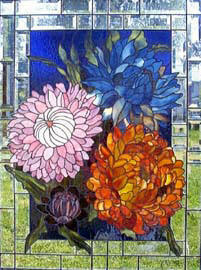 The Baltimore art gallery, Zoë's Garden, needed a companion panel to the "Sweet Peas" we had done a few years ago. We saw these beautiful Helichrysum and just couldn't resist trying to capture them in glass. Once drawn using the Glass Eye 2000 software, the challenge was to find the best art glass and stained glass to bring them to life both in reflected light and refracted lighting conditions. When choosing glass, the artist must always consider that the window must be beautiful in all lighting conditions and when viewed from both sides of the work. When the pattern hit the table, as you will see, we improvised a bit more by adding another row of bevels to surround the beauty of these abundant petals. Cutting bevels is always a touchy challenge but using the reverse-paper-on-glass method allowed for accurate cuts and a perfect fit. The cuts are accomplished with a glass saw, looking through the planes of the bevel to see the paper pattern glued to the flat surface below. Remember when foiling these bevels that you have cut into the thickness of the bevels and will need to use double width foiling to create the proper leading channel for soldering. Lead came will not work for this border due to this fact. For the best consistent soldering line be accurate in your cuts. If it doesn't break right the first time, make the time and do it again. This results in less distracting solder lines and your solder lines become an essential part of the artwork. 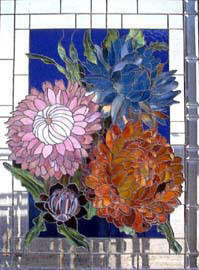 As you work in glass, you will find that some designs are line driven and others are color driven. Well, this design is both! When you are foiling be careful to keep your foil lines consistent. Vary your foil widths and backing colors to emphasize certain lines and change glass colors slightly. Much of the quality of your soldering will be determined by the accuracy of your foil work. 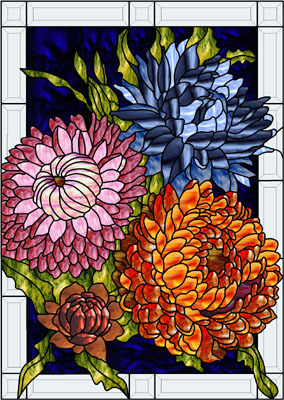 Glass choice is determined by color groupings and density which gives the panel depth and the flowers dimension. Be mindful of where the shadows fall and choose that part of the sheet which runs more opaque or "darker" than the rest of the sheet. This keeps the color in the same family or shade yet allows the petal to recede. Also keep in mind that all of nature is in constant flux. From the time a bud or a leaf or stem forms and eventually blooms and grows, some part of it is fading, so not all petals and leaves will have that fresh and just formed appearance. Study the true color of the object. Allow for some imperfection! Imperfections are part of its beauty. This is truth in art. We surrounded the panel in ¾" u-flat came and used "Handy Hangars" to attach the hanging chain. This pattern and dozens of other unusual floral designs will be included on our pattern CD collection "In Full Bloom II" due out in the Fall of 2006. Enjoy the summer flowers!